This is the first of (hopefully) a monthly recap of books I have recently read. I'll give my general thoughts of each book along with a more in-depth look at what I found to be interesting/insightful/inspiring about the books. Or, I may find that things are best left in the words of the author, and leave a few notable quotes for you to digest yourself. 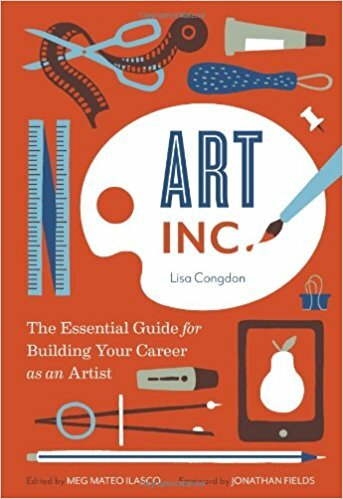 I found this book to be very practical and full of useful information, especially for up-and-coming artists in the fine art world. I especially liked the mini-interviews with successful artists, which were very informative and motivating. It's fascinating to hear so many different pathways to success, and especially inspiring to learn about artists who have created artistically fulfilling careers without sacrificing their vision. Personally, I skimmed over the two chapters that dealt with exhibitions, galleries, illustration, and licensing, only because I am not involved in those areas, however I would highly recommend this book as a road map for anyone who is interested in those topics.